Dr. George Bournoutian will give a lecture and book signing in connection with the publication of his newest work, Tigranes II and Rome on Monday, February 25, at 7:00 p.m., in G-Hall at the Diocesan center of the Diocese of the Armenian Church of America (Eastern). The event will be co-sponsored by the Krikor and Clara Zohrab Information Center and the National Association for Armenian Studies and Research (NAASR), based in Belmont, MA. Tigranes II and Rome is the first English translation of an important work of Armenian historiography and was recently published as part of Mazda Publishers Armenian Studies Series with a major grant from NAASR and other funders. Bournoutian is also the author or translator of numerous other books, including A Concise History of the Armenian People (2002), Two Chronicles on the History of Karabagh (2004), and The Travel Accounts of Simeon of Poland (2007). He is Senior Professor of History at Iona College and has taught Armenian history at Columbia University, Tufts University, New York University, Rutgers University, the University of Connecticut, Ramapo College, and Glendale Community College. Tigranes II and Rome was written by Hakob H. Manandyan (1873-1952) in Armenian and published in Yerevan in 1940. Manandyan is revered as one of the major Armenian historians of his era but very little of his work has appeared in English. 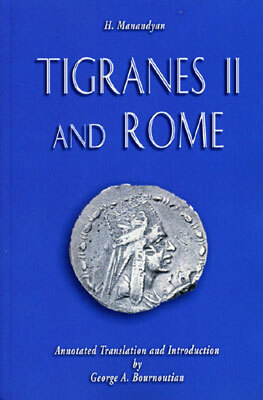 His book on Tigranes represents the first serious attempt to examine the 1st century B.C. Armenian monarch without appealing to patriotic sentiments and with a grounding in Greek and Roman sources. Tigranes II, well-known to Armenians as Tigran the Great, is the sole Armenian monarch who not only succeeded in unifying all the lands inhabited by the Armenians but also extended Armenian rule into Syria and northwestern Iran. He created an Armenian empire which lasted for some two decades, taking the title of “King of kings,” which until then was only held by the kings of Parthia. Tigran’s greatness lay in his attempt to forge an independent and powerful state and to break away from the constraints imposed upon Armenia by its geography as he tried to free Asia Minor from Persian military and political threats in the east and those of Rome in the west.